FRANKFORT, Ky. – The middle of July usually means less grass mowing because of the parched, brown conditions of most lawns. Streams normally run low and clear in mid-summer and concern about drought clouds people’s minds. The Kentucky River at Frankfort looks like a flowing ribbon of foamy chocolate milk. 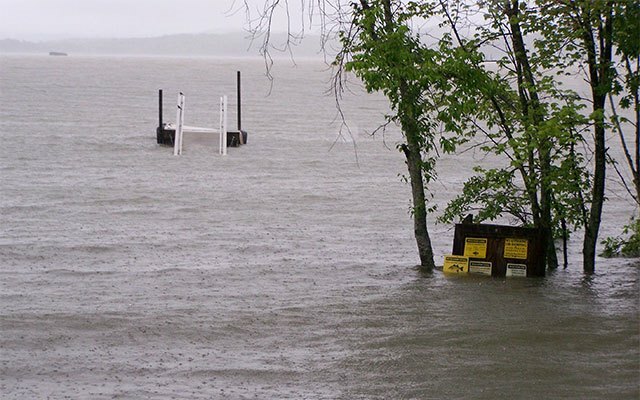 This week, Buckhorn Lake in eastern Kentucky’s Leslie and Perry counties rose 13 ½ feet above normal summer pool while central Kentucky’s Taylorsville Lake swelled to 18 ½ feet above it. The unusually high water makes for unsafe conditions for boating, canoeing and kayaking as well as swimming on Kentucky lakes and rivers. Carrier and Zac Campbell, boating safety coordinator for Kentucky Fish and Wildlife, both recommend reducing speed during the day during this high water period. “I would also recommend only running at idle speed at night,” Carrier said. The wacky weather this year, beginning with record cold and snow and now with unseasonal torrential rains in July, corresponds with 13 boating fatalities and a dispiriting 25 accidental drowning in public waters so far in 2015. Kentucky only suffered 10 boating fatalities and 11 people drowned in public waters all of last year. A pontoon boat seems to the eye one of the safest and easiest boats to operate, but they are actually problematic. Current makes pontoon boats hard to maneuver and their canopy and tall sides catch the wind. They are often underpowered, especially with several occupants aboard. Pontoon boats have a capacity plate showing the weight limits and number of occupants for safe operation of the boat. Operators must consult that plate before loading a pontoon boat with people. Do not exceed the stated limits. Campbell recommends paddlers wear their lifejacket at all times, regardless of water level, but it can save your life if you upset in roaring water. It is disturbing to ponder on the 25 people who drowned so far in 2015 in public waters. Most were simply having fun and tried to do too much. “Many people misjudge the distance on the water because it’s flat,” Carrier said. “The other side of the cove looks closer than it really is. People also overestimate their ability when it comes to swimming.”Several of the drowning cases this year involved people swimming across coves for fun or to fish or swimming out to navigational buoys and back. Boater’s fatigue is another dangerous factor impacting boat operators in summer. The combination of sun, wind, motor noise and boat movement can induce a near trance-like state, dulling reaction time.